Have the two religions always gotten along as well as Mitt Romney and Paul Ryan do? Photos by George Frey/Getty Images; iStockphotos. Mitt Romney’s choice of Paul Ryan as his vice-presidential candidate makes 2012 the first time in American history that a major party has run a ticket without a Protestant on it: Romney is a member of the Church of Jesus Christ of Latter-day Saints, and Ryan is a Roman Catholic. Have Mormons and Catholics always gotten along as well as the Republican running mates appear to? No. The root of the conflict is doctrinal. The premise of the Book of Mormon is that the Bible is a corrupt and incomplete account of God’s revelation—an implicit criticism of Catholic doctrine. The Book of Mormon also makes reference to an evil “church which is most abominable above all other churches,” described more colorfully as “the mother of harlots.” Though the Book of Mormon does not identify this evil institution as the Catholic Church, many Mormons have believed the two to be one and the same since the publication of the Book of Mormon in 1830. 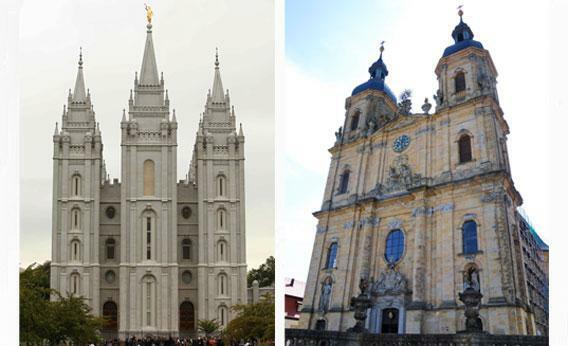 Despite their doctrinal differences, Mormons and Catholics cohabited peacefully in Utah in the 19th century—but leaders of the two churches began passive-aggressively sniping at one another in the 20th century. In the late 1910s, Salt Lake City Catholic Bishop Joseph Sarsfield Glass commissioned murals in the Cathedral of the Madeleine that incorporated Bible passages that could easily be read as criticisms of Mormonism, including a line from St. Paul’s letter to the Galatians that describes any alternate gospel as “anathema.” And in the 1930s and 1940s, a Catholic radio program and a Catholic pamphlet entitled “A ‘Foreign Mission’ Close to Home!” convinced Mormon leaders (mistakenly) that Catholics were trying to convert Mormons to Catholicism. Mormon mistrust of the Roman Catholic Church came to a head with the 1958 publication of Bruce R. McConkie’s encyclopedia-like Mormon Doctrine, which was not an official LDS publication, though McConkie was a low-ranking church leader. McConkie’s entry for Catholicism simply referred readers to another entry called “Church of the Devil,” which explicitly identified the Roman Catholic Church as being “most abominable above all other churches.” McConkie’s book so upset the Catholic bishop of Salt Lake City that he visited the LDS church president in tears, which convinced the LDS leader to rein in anti-Catholic sentiment. Derogatory references to the Catholic Church were removed from later editions of Mormon Doctrine (which is now out of print), and Mormon-Catholic relations in Utah became much friendlier in the 1960s and thereafter. The most notable recent Mormon-Catholic clash came in 2001, when the Vatican began requiring Mormons who converted to Catholicism to be rebaptized (a move that implicitly called into question the Christian bona fides of the Mormon church). But the past decade has been a time of alliance between the churches, with Mormon and Catholic leaders coming together to fight gay marriage in Hawaii and California and to stand against perceived government encroachments on religious freedoms—stances that align with the Romney-Ryan platform. Explainer thanks Gregory A. Prince, co-author of David O. McKay and the Rise of Modern Mormonism. Read all of Slate’s Mormon Explainers.